Champions must work like they've never won a thing, or they never will again. Get WBFF champ Shaun Stafford's full plan! By the time most men enter their 30s, they realize two things: Their body is less forgiving than it once was, and there's a lot to forgive. As a man's metabolism slows, those missed workouts and speed-dialed pizzas usually lead to a growing gut. A more elite group of men never stop working out. For them, their 30s are the entrance to their prime, not the beginning of their decline. Take Shaun Stafford. He won the WBFF World Championship in 2012, but that wasn't his first taste of victory. See the accompanying stat box for his impressive competitive resume to date. Never one to rest on his laurels, Stafford now has his sights set on winning the WBFF Worlds again August 23-24 in Las Vegas. It takes a killer plan to repeat, so we connected with Stafford to score the details about his contest prep and other matters. 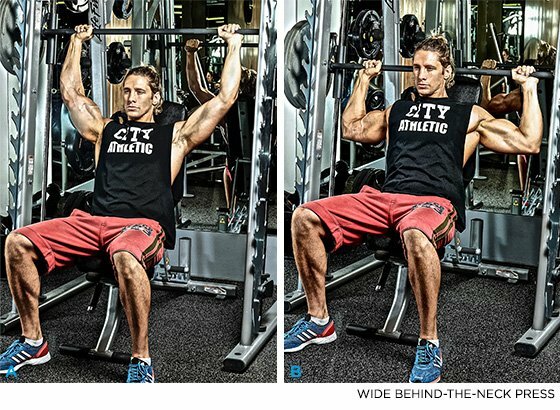 Read on to learn about his multi-angle triset workout! Everyone notices when someone has a nice chest with visible abs, but the back is perhaps more important for overall strength. How do you balance work between the two muscle groups? Stafford: I like training back way more than chest. If it was a choice, I would always opt for a back session. Depending on what sort of split I am using, I often train chest and back together. I find it gives a nice balance around the joint, and helps me keep in proportion. It also gives one hell of a pump through the upper body! As a WBFF model, what's your main focus physically? How do you gain mass without becoming massive? To improve my overall physique. 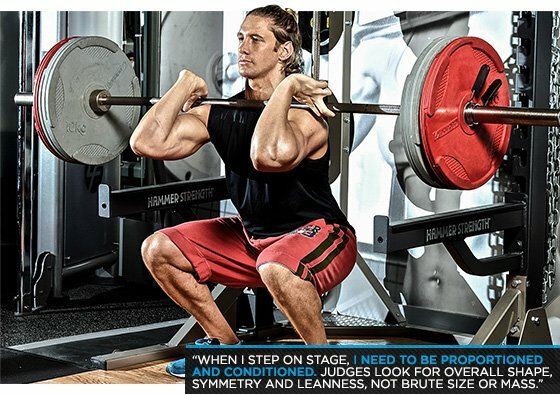 When I step on stage, I need to be proportioned and conditioned. The judges look for overall shape, symmetry and leanness, not brute size or mass. Obviously you always want to progress in the gym, but it's about achieving a balanced physique. I let my diet do a lot of the work: I eat clean pretty much year round and never let my body fat get too far above 10 percent. The aim is to have a natural and healthy look, so I tend to lead a natural and healthy life. What goes through your mind when you see yourself on a magazine cover? It is a pretty cool feeling. I'm not going to lie! You normally get to see it before it hits the shelves, so it's not a shock. It's quite nice when you get texts from friends all over the world, or from your parents and family who take snap shots, and send them through to you on Facebook or Twitter. It'll also be nice to have a few copies in the bookshelf to show the kids when I'm old and fat! Do you ever get tired of working on how you look? Is it a full-time job? I get tired of having to skip pudding. I have a sweet tooth and love ice cream! But I only really have to do this when I'm preparing for a shoot or show. To be honest, I love training hard, and eating well makes me feel so much better. I don't actually spend that much time on how I look; it is more a byproduct of how I live. When you get booked for a shoot, or you have a show coming up, you do make sure you sleep more, that you get a tan before the day, and take care of some of the grooming aspects of things, but it isn't a full-time job! This workout routine is all about trying to keep a serious amount of time under tension on the muscles, while working them through a variety of different angles. The triset format means that you go from the first exercise, straight into the second with only a short 10-second rest, rest another 10 seconds, and finish it off with the third and final exercise before taking a 90-second break. The triset hits several different angles, usually from the most biomechanically weak position (think wide-grip pull-up) to the most biomechanically strong position (think chin-up). As you fatigue, you make the exercise easier by altering the biomechanics of it. This is quite intense, and the overload on the muscle is extreme. The tempo for each lift should be under control, with an extended negative. After the five-day rotation, repeat the splits six times; the program takes 30 days. This style of workout is high volume, and should be done following a strength-based series of programming. The intensity of the workouts improves all-around fitness and helps drop body-fat levels. Azealia Banks ft Lazy Jay - "212"
The Neptunes - "Blaze of Glory"
Chase & Status - "Blind Faith"
Photos by Toby Harrison; shot at City Athletic Performance Gym.